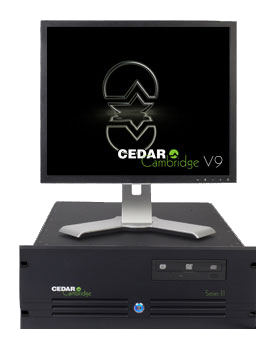 CEDAR Cambridge V9™ is the latest revision of our acclaimed system. It boasts many new features and tools for restoring vast quantities of audio for broadcasters, archives and libraries, for homing in on the tiniest blemishes for the highest quality music, film and TV remastering purposes, and for extracting the maximum intelligibility for audio forensic investigation. Developed in response to requests from national sound archives and libraries, the XML extension extends the Batch Processing system and allows the processing applied to each audio file to be specified by a software file called a batch token. This contains information such as the location of the source audio and its file name, what processes you would like to apply to the audio, where you would like the results deposited, and whether you would like a processing report generated. In addition, an XML log file can be created for each batch job. If the Report Generator is available on your system, the Batch Processor now allows you to generate an individual report in either XML or HTML format for every track it processes. The reports are stored alongside the processed audio, so large quantities of track and processing metadata can be added efficiently to users' databases and asset management systems. CEDAR Cambridge V9 allows users to localise much of the system's user-interface, including its tooltips. Translation is straightforward, simply requiring the entry of the new language terms alongside the English ones in a text file. The resulting language files can be supplied to CEDAR Audio, added to the localisation library and, where appropriate, made available to other users. Surveys have shown that television advertisements can be as much as 20dB louder than the surrounding programme material, leading to numerous complaints about broadcast quality. In response to this, the Commercial Advertisement Loudness Mitigation Act, or CALM, went into effect in the USA in 2012, requiring that the audio loudness be at a consistent level across programming and advertisements. Another requirement of the Act is to be able to log audio levels to prove compliance. Failure to meet the appropriate standards (the ATSC A/85 standard in the USA and the EBU R128 standard in Europe) and to be able to prove compliance may result in fines, so CEDAR Cambridge V9 offers two new facilities - Track Loudness View and Track Loudness. The first of these allows you to determine whether your audio conforms to a given standard. If it doesn't, you can use the Track Loudness module to correct this. To ensure the widest range of compliance and to allow for future changes to the regulations, additional loudness standards can be defined by the end-user. Following processing, you can use the Track Loudness View to confirm that your audio complies with the chosen standard and, to ensure compliance, every report contains the Track Loudness statistics. What's more, the Track Loudness module can be used together with the Batch Processor and the XML Extension to ensure that - with minimal effort from the user - whole libraries can be made to conform to local regulations in a tiny fraction of the time necessary using other methods. Most buzzes and hums have partials lying on every harmonic. For example, a 50Hz buzz will show spikes at 50Hz, 100Hz, 150Hz, 200Hz... and so on. Occasionally, a buzz will comprise predominantly or only odd harmonics: in this example, 50Hz, 150Hz, 250Hz, 350Hz... and so on. If this is the case, the new Odd Harmonics option eliminates processing at the even harmonic frequencies to ensure that no unnecessary processing occurs, resulting in even less risk of damage to the genuine signal. In addition to all of the above, there are minor improvements throughout CEDAR Cambridge V9, such as new Hot Keys in modules such as NR-4™, NR-5™ and Retouch 5™, improvements to some of the layouts to allow more space for legends, and an improved menu system for the multi-channel knobs. CEDAR Cambridge V9 is now a 64-bit application. It will run on Windows Vista and Windows 7, but this means that Windows XP has finally been left behind. If you are still running an early Host System and Windows XP, and would like to update your system to V9, please contact us to discuss an upgrade to the latest CEDAR Cambridge Series III hardware and Windows 7 Ultimate Pro 64. Finally, V9 supports Remote Desktop, which can be set up by nothing more than creating and setting a registry key to ensure that the knobs and sliders work correctly. A wide range of training courses will be offered at our premises in the UK. Please contact Clive Osborn or Alan French for details. CEDAR Cambridge V9 is immediately available. We recommend that it's hosted by the latest CEDAR Cambridge Series III™ hardware running Windows 7 Ultimate Pro 64. Earlier systems may not support V9, or some features may be unavailable. As always, software upgrades to both the core system and to existing modules are provided free of additional charge to existing users. A full set of OS and hardware upgrade options are also offered. CEDAR Audio is the world's only company dedicated solely to the fields of audio restoration, noise suppression and speech enhancement for the broadcast, post, and mastering communities, as well as for archives, libraries and audio forensic investigation.